PVC stands for PolyVinyl Chloride. 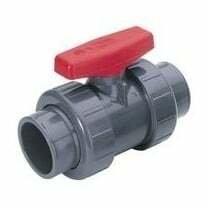 PVC ball valves are widely used in water management and irrigation. PVC is suitable for corrosive media, such as sea water. Moreover, the plastic material is resistant to most acids and bases, salt solutions and organic solvents. PVC is not resistant to aromatic and chlorinated hydrocarbons. The maximum medium temperature is about 60°C (140°F).